BOZEMAN, Mt. 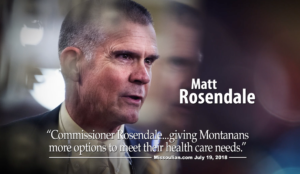 – Americans for Prosperity-Montana (AFP-MT) launched a more than $500,000 digital and TV ad buy today thanking State Auditor Matt Rosendale for protecting health care choices for Montanans. The thirty second spot includes a testimonial from a Missoula woman named Cami who was able to get quality medical care at an affordable rate thanks to direct primary care. Last year, Matt Rosendale led the effort to advance direct primary care following a veto of direct primary care legislation by Governor Bullock.